It seems in Ireland that we are not too fond of clustering. We are the least urbanised country in Europe – on a par with Portugal – with less than two thirds of the population living in cities. Elsewhere in the high-income world, typically more than 80% of the population live in cities. It is important to remember, though, that this is not because we have a different economic structure. Previously, we might have been less urban because we were a more agricultural society. Now, though, over 85% of our jobs are in our main cities. So we have a huge mismatch between where we work and where we live. These leaves us with some of the longest commutes in Europe. The number of people commuting more than an hour each way on a daily basis went up by more than a third between the 2011 and 2016 Censuses. You might think that this is just because Irish people are different. “We want our patch of land”, the argument goes. Funnily enough, this is also what people in the UK say – even though they are one of the most urbanised countries. It’s unlikely that our poorly placed homes are as a result of our preferences, therefore. And if it’s not demand-led, then it must be supply-led. Planning and zoning rules are one of the principal determinants of housing supply. Indeed, the best research shows that, in response to a 10% increase in demand for housing, as long as land-use regulations do not stop supply from responding, prices need not increase at all. But Ireland’s housing market is, as we all know, a heavily regulated one. This week, Apple scrapped its plans to build a data centre in Athenry. This news came as a surprise to nobody. In the time it took Apple to open the doors to a data centre in Denmark, and start planning a second one there, it was still facing court challenges here. Fortunately, it looks as though the Government is finally seeing the harm that land-use regulations can bring. Its Ireland 2040 plan is the first government strategy to acknowledge the cities, and city centres specifically, will have to be the driver of population growth in the future. Public policy, therefore, is turning – however slowly – in favour of density. But another fight still remains – in favour of clustering. Density is about how many people in a certain neighbourhood. Clustering means the same kind of activity in the certain neighbourhood. Don’t get me wrong – diversity is important. Jane Jacobs – who wrote one of the bibles of urban economics back in the early 1960s – explained in simple terms how having a mix on the street keeps it safe. But in large cities, there is scope for both diversity and clustering. We know that clustering is a natural human tendency. Just look at the oldest street names in our cities. In Dublin, the old Viking city includes Winetavern Street, Cook Street and Fishamble Street. Last year, Dublin City Council changed its rules in order to make it harder for student accommodation to cluster in and around higher education institutes. This is as daft as it sounds: by making it harder to build new accommodation for them, they will continue to band together in fours and fives and – with a budget of up to €600 each in central Dublin – easily displace low-income renters. Instead, the city council – and its peers elsewhere in the country with higher education institutes in or near areas they control – need to think about where its “Student City” will be. Over the next decade, full-time student numbers are set to rise by roughly one third. On top of this, the Government has made higher education as an export one of its priorities. This will increase student numbers even further. All of these students will need somewhere to live. And if we don’t have purpose-built student accommodation for them, they will gobble up more and more of the existing stock of dwellings – which are disproportionately family homes. In addition, purpose-built student accommodation doubles up as tourist accommodation in the summer. So meeting the needs for student housing will also ease the pressure on the short-term lettings market, the so-called Airbnb effect in the rental market. I’m sure we could all think of potential locations for Dublin’s “Student City”. An obvious one is Dublin’s fruit markets, between Smithfield and Capel Street. This area is close to 17 acres of prime urban land, within walking distance of the Luas, both main train stations, and the DIT and Trinity campuses. Most of it is currently used as single-floor warehouses for fruit and veg. While those businesses would certainly need to be accommodated – could they use the basements in a new set-up for example? – it is important to keep perspective on the size of prospective benefits as well as the costs. Where’s hot and where’s cold in the rental market? During the week, the latest Daft.ie Rental Report was released. Its main findings were not unexpected: market rents continue to rise and at a rate above 10% on average. At least in the long term, that is an unsustainable rate of rental growth. Indeed, in a healthy rental market, rents would have increased by roughly zero over the last few years – in line with general prices and in line with the idea that new supply can emerge to satisfy demand. But we have far from a healthy market. Countrywide, rents are now 11.5% higher than a year ago – and up 70% on average from their lowest point over five years ago. There is a third relevant comparison – with the peak. In almost all parts of the country, rents are now well above their Celtic Tiger peak, which occurred in the rental market in early 2008. Rents have now increased every quarter for the last 23 quarters – nearly six years – and for each of the last eight quarters, year-on-year inflation has been above 10% and a new all-time record rent has been set nationwide. This picture is remarkably similar around the country. The year-on-year change in rents is 10% in Dublin 4, 12% North County Dublin, 10% in county Galway and 11% in Wexford. So the mismatch between supply and demand is countrywide. But those changes in the last 12 months are only part of the story. The turning point – when rents went from falling to rising – was different around the country. So the cumulative rise in rents from their lowest point varies quite a bit depending on which market you’re looking at. The table alongside this piece shows the five hottest and five coldest rental markets in the country, using an exclusive new set of figures drilling into nearly 400 rental micro-markets around the country. The hottest markets are those that have seen not only one of the largest increases in the last year but also from their last lowest point. It’s clear that Dublin dominates – but equally that it’s not necessarily the fanciest areas. Alongside Sandycove, one of the country’s most expensive markets, is Dublin 17 (near Darndale and Clongriffin) and Dublin 20 (Palmerstown). In those hottest markets, rents have effectively doubled from their lows in 2012/2013. At the other end of the market, it is Donegal that dominates. Three of the five coldest markets – defined by the change in rents over the last 12 months and since the low – are in the county. The other two are in north-west Mayo and Ardagh and the north-west of Limerick. In the coldest markets, rents have only risen by less than 20% from their lows. And in many of those markets, rents only bottomed out in 2014 rather than in 2011. It is worth digging into those colder markets a little more. Of the 389 micro-markets around the country, 11 are currently showing falling rents– not rising. Eight of those are in the north-west, furthest away from urban centres. And seven are in Donegal, where the nearest urban centre – if you don’t count Letterkenny – is across a border whose future is extraordinarily uncertain right now. There are 14 micro-markets in Donegal in total – so what can we tell from the others? Whereas rents near Derry are falling and have only 15% higher than their lowest point, rents in Letterkenny are up – albeit modestly, by 3.5% – in the last year. They are also roughly one third higher than four years ago. What do we take from all this detail? There is an obvious point – Brexit uncertainty is incredibly detrimental to the local economies that will be most affected. And there is a deeper point. While Letterkenny is not a large town – its population in 2016 was roughly 20,000 – even that can act as an economic centre for the area nearby. In particular, the location of jobs is what matters. Ireland is in the somewhat unusual position of having a growing urbanised labour market – but a static and sprawled housing market. Solving sprawl will take time and a diversity of housing options, not just another ring of 3-4 bed semis on greenfield sites. Solving static housing supply doesn’t have to take time, though. As it has been for the last five or so years, the mantra must be: supply, supply, supply. Gentrification has become something of a dirty word. It wasn’t always this way. Most cities worried about the opposite – what you might call “slumification” – until quite recently, as those with the money moved to the newer suburbs. But in the last 20 years or so, older areas – in particular city centres – have become fashionable again. There are lots of theories about why. Some people credit the TV show Friends with making cities cool again. But if you ask me, it’s about pollution. Take Dublin. Up to the late 1980s, there was an obvious reason you moved outside the canals once you had the means: the city was dirty. Once the city made the move to smokeless fuels, though, it was no longer the no-brainer it had once been. And since then, areas like Portobello from the 1990s, Stoneybatter from the 2000s and more recently Cabra and Newmarket have prospered. With higher-income households moving in, a variety of new amenities – shops, bars, cafes, restaurants and pubs – have followed suit. But how then has gentrification become a dirty word? It’s because, with a fixed supply of housing, for higher-income households to move in, it means that lower-income households are priced out. And that is where opposition to gentrification – understandably – comes from. It doesn’t have to be this at all, of course. Like so many cities across the high-income world, Dublin has boxed itself into a corner with land-use restrictions. By placing very strict limits on how much housing can be put everywhere within the city limits, and what kind of housing, Dublin has gone from being no more expensive than the rest of the country as recently as the 1980s to almost twice as expensive today. The outlook for Dublin and other Irish cities is for very strong demand for apartments over coming decades. As household size declines, and as urbanization continues, the cities will need to accommodate these smaller households in more central locations. This means we have to get good at “brownfield” redevelopment – as opposed to new development on greenfield sites even further away from jobs. A sure-fire way to lose political support for redevelopment is to create a cohort of people who lose out from the process. And the most obvious group that could lose out are existing residents of inner city areas, many of whom are on average or below-average incomes. One potential solution is for city councils to offer permission for redevelopment but insist that existing residents have a right to remain. Not in their existing homes, obviously – other redevelopment could occur – but in a new home built in the same neighbourhood and no smaller than their existing home. Take Clanbrassil Street, on Dublin’s south side. It is an ugly hotch-potch of a street, riddled with the scars of the 1980s, when planners sought to drive a highway through the heart of old Dublin. But it is in the middle of areas that are regenerating. Given how wide it is, there have been developments of up to 8 storeys in recent years. These sit awkwardly opposite or beside two- and three-storey low-density social housing, built long after social housing won awards for design but before it was energy efficient. In the grand scheme of things, it is easy to see what should happen. The City Council should want Clanbrassil Street to fully redevelop and take advantage of the opportunity it has to become an urban hub. But the grand scheme of things doesn’t take into account how individuals’ lives will be affected. So, rather than sell off the social housing and wish its existing residents the best for the future, the Council should instead put out a call for expressions of interest, where parties can propose what they would do with the site. But every proposal for the site would have to include accommodation for all existing residents. Why would this be in the interests of a for-profit developer? Suppose in the ordinary scheme of things, a developer was allowed to build to a height of eight storeys in the area. Under a “right-of-residency”, with two storeys already there, the developer would be given permission to build to 10 storeys. This way, everyone wins: the Council gets some of the redevelopment it (hopefully) wants to see, its tenants get far nicer accommodation, and new residents get to live where they want, instead of being pushed further down the motorway network. There is, of course, nothing to stop a brave Council extending such a scheme beyond its own housing stock. In principle, a developer could woo the owners and residents of ten existing houses to sell up, knowing that they would find a new home in the new accommodation. Gentrification has become a dirty word because it creates losers as well as winners. But it doesn’t have to. A smart policy system can ensure win-win. Tying redevelopment with a right to remain is one way of doing that. Building tall – are our policymakers mixing up supply and demand? Last week, the Department of Housing released three different reports on the cost of building on the same day. The viability of construction is, arguably, the single biggest policy challenge facing the country right now – given just how severe the housing shortage has become. Therefore, the information ‘dump’ at least shows that the subject has been the focus of policymakers’ attention. Nonetheless, there are some peculiar findings contained in those three reports. One – the questionable claim that building here is not expensive – was the subject of last week’s column. Today, though, I’d like to focus on another claim in these reports, one contained in the report ‘Review of Delivery Costs and Viability for Affordable Residential Developments’. Its executive summary states that building six storeys, or higher, is more expensive, “contrary to common understanding”. This last part sounds like a Trump-ism. Whenever Donald Trump says, “Not many people know this but…”, you know he just found out whatever he’s about to say next – which may be common knowledge to many. I am not aware of anyone with even a passing knowledge of construction who thought, before this report was published, that building fifteen storeys was cheaper or simpler than building three. Certainly, some fixed costs scale down the more units are built – such as the site cost per unit (assuming the site is already purchased), or the lifts. Indeed, this last point is not trivial. Suppose a developer is allowed to build eight storeys rather than five. Given that public policy specifies the maximum number of apartments that can share a lift on a particular floor, the extra 60% of apartments will dramatically reduce the cost per unit of the lifts. However, in general, the structural works required for a building of 15 or 18 storeys is completely different – and more expensive – than those required for a building or four or five storeys. OK, so some policymakers thought building taller was cheaper and found out it isn’t. What harm, you may wonder? Unfortunately, the report goes on to conclude “6-storeys is an optimum height… for the delivery of apartments”. And this is where the report falls foul of making a classic error in economics: mistaking supply for demand. Suppose the government came out with a new policy in relation to travel agents: because it is so expensive to fly to Australia and New Zealand, a new ban will be put in place on package holidays to those destinations. Why would they ever do such a thing? To increase viability of holidays, of course. Nonsense, you might think. Even if something is more expensive, there could still be demand. Plenty of people might be able to afford Australia or New Zealand. In fact, for some, one of those destinations may have been their first choice and now they have to go somewhere else. Making it viable to build a home for a household on an income of €50,000 should never mean making it impossible to build a home that would cater for a household on an income of €150,000. Indeed, one of the basic insights of economics is that, if you want housing to be affordable, building expensive homes helps – as long as it is in sufficient quantity. Suppose it was impossible to build a home for anyone on less than €50,000 – but that the construction sector built a new home for every single household on an income above that. What would happen rents for those earning less than €50,000? They would, of course, go down – because the competition for the homes they can afford has been diverted away. So, by all means, officials should do their best to change policy so that good-quality apartments can be made for just €100,000, rather than the €300,000 or more it takes currently. But they should be equally in favour of new supply for those on higher incomes – including supply on an 8th, 10th or 20th floor. A second cousin of the “don’t build tall because it’s expensive” argument is also doing the rounds currently. It goes along the following lines: regardless of the merits of building tall, don’t change the rules now because all the plans that are live now will go back to the drawing boards. Ironically, you are most likely to hear this argument from someone who also believes that what we are building, we are building for decades, possibly centuries, and therefore we need to get it right now. As it happens, with demographic trends, the country needs roughly 1.8m apartments built over the next six decades. That 22,000 per year, or over 420 every week until the 2080s! This is simply not going to happen at four or five storeys, so at some point the rules will have to change. Not only that, but given that so little is on the plans right now, there has probably never been a worse time to use the “don’t build tall because it’ll set things back” argument. On top of that, developers are already factoring in a change in the rules and putting stronger foundations than their six-storey buildings need, so that once the rules change, they can add an extra two or three storeys. The point of building twice as tall is not that those extra units are, themselves, cheaper. In fact, with the views, they are likely to command a premium. The point of building twice as tall is that, with twice as many new homes built, the downward effect on prices and rents will be twice as large. Don’t ban holidays to Oz and don’t ban building tall! This week, a flurry of new reports came out about the housing sector. 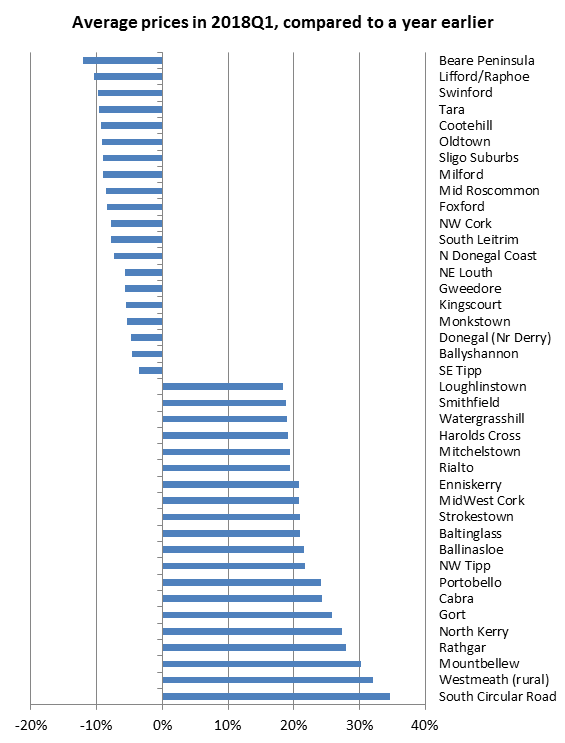 One, published by the Housing Agency, compares residential construction costs in Ireland to other European countries. It compares the cost of building in Ireland with costs in the UK, France, Germany and the Netherlands. Given that the cost of construction is arguably the single biggest contributor to the housing supply crisis, it is worth delving into this report in a little detail. The underlying data come from CEEC, the European Council of Construction Economists and Eurostat, as well as country-specific data sources, such as the Society of Chartered Surveyors and the CSO in Ireland. The figures ultimately come from 30 completed projects across the five countries, with most projects completed earlier in the decade and ‘scaled up’ by cost indices. As is true of any cost comparison, it had to make a number of assumptions in order to come up with results. In this instance, it only focused on what are known as ‘base construction costs’. In other words, in addition to excluding site costs, profit and VAT, a host of other costs – integral to the provision of regular housing – had to be excluded too. Professional design fees, as well as sales, marketing and legal costs, are not included in the study. In addition, substructures – especially basements – are specifically excluded, as are all external works – roads, paths and fencing – and site utilities. While the exclusion of site costs and VAT is perfectly understandable, it is less obvious that professionals’ fees and the cost of a basement should be excluded. This is particularly true if the construction of a basement is mandatory in Ireland but not in other countries. As basements are very expensive to dig, what may look like similar costs could be very different once plans meet reality. Similarly, the choice of countries is somewhat unfortunate in both scale and scope. A comparison with four other countries is not nearly as useful as a comparison with 14 (the number of CEEC members) or 40 (not far from the total reported by Eurostat). More worryingly, the countries chosen were done specifically because they have the labour costs that are “broadly comparable” to Ireland. This is somewhat cart before horse. If labour makes up roughly two thirds of base construction costs, then to focus only on countries with a similar labour cost will drive the results. How does Ireland compare with Denmark, Sweden, Estonia or Austria? Those are not meaningless comparisons. In fact, it may be more meaningful to compare with countries of a similar size, rather than with the UK, France and Germany. Perhaps just as importantly, the idea of comparing countries with each other is also of limited value. Within the UK, as the report itself notes, construction costs are almost twice as high in London than in Belfast. A more natural unit of analysis is the city, not the country. Large cities do appear to have more expensive building costs than small ones. And this study has put Dublin – and Cork and Galway – in with some of Europe’s biggest cities. It is therefore not as surprising as it may seem that the headline finding of the report is that construction costs in Ireland are similar to the UK, France and Germany. They are, however, almost 20% more expensive that in the Netherlands, something that the report is oddly silent about. But perhaps the single biggest limitation of the report is that it is only in index form. Costs in Ireland are expressed as the number “100” and other countries are given relative to this. It is impossible to convert this into affordability and into policy. We know, for example, from reports by Turner and Townsend, that inflation in Dublin build costs is higher than almost anywhere else they analyse in their reports. (Istanbul and Buenos Aires were the only cities – of 43 covered – with higher cost inflation than Dublin.) Thus, it is somewhat hard to believe the findings of this report that say costs haven’t changed since 2010. But we also know something from Turner & Townsend reports that is not reported in the Housing Agency’s study: the level of costs. The Turner & Townsend report for 2017 estimates that the cost of building low-rise apartments in Dublin was almost €2,000 per square metre in 2016. Once you have per-square-metre costs, it is possible to work out a baseline for overall costs and therefore for the minimum rent needed for a project to break-even. Crucially, this break-even rent can be compared to incomes in the real economy. But with an index, none of this is possible. And this is where further concerns arise with the Housing Agency figures: they just don’t seem to tally with anyone’s experience of the construction sector right now. 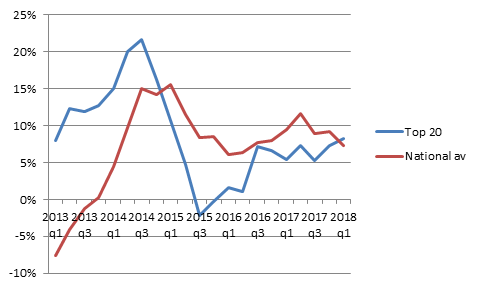 Going back to that Turner & Townsend report, it believed that based on prevailing inflation, the per-square-metre cost was expected to rise to above €2,100 in 2017 and, if pressures in the market do not change, to almost €2,300 this year. This would put costs in Dublin almost 50% higher than in Paris or Amsterdam, 70% more expensive than Munich and over twice the level in Madrid. The report released this week by the Housing Agency is so starkly at odds with both sentiment in the sector and other reports such as the one cited above. For that reason alone, it would have been helpful for the report to dig into those differences. Without that analysis, it is likely that this report will generate more heat than light – on a subject about which much ink has already been spilled. If vision drives strategy, then details drive tactics. Unfortunately, the new costs report does not have the detail that can enable policy to boost housing supply. Value capture is the latest buzzword for city officials around the world. The term refers to the idea that social investment – from maintaining urban parks, national monuments and Blue Flag beaches to putting brand new transport infrastructure – creates value and this value can be captured. The most obvious – and in most countries, the easiest – way to capture some of the value of social investments is through an annual property tax. Think about the Phoenix Park. In work undertaken by ESRI researchers a few years ago, they found that the park adds significant value to properties nearby. Indeed, they found that all urban green space has this effect – but that the Phoenix Park, probably due to its size, has an even bigger effect than a regular park. The Office of Public Works is responsible for the Park. To them, or indeed to any of the City or County Councils that run their own parks and green spaces, this finding is incredibly valuable. Why? Because it helps to quantify, in monetary terms, the minimum social benefits due to the park. Imagine being an official in the Parks Service of the OPW or a local authority and being constantly told that they are a cost centre. Deep down, though, everyone knows that parks create value. And the housing market tells us the minimum value created. With a system where property taxes reflect market values, it is possible to go one step further and create a link between that value and the running costs of those parks. In other words, cities can set aside a fraction of property tax revenues that reflects the value of, for example, an amenity like parks, in order to pay for the cost of maintaining those parks. For some Irish people, admittedly, this would be an about-turn in how to think about property tax and their local authorities. Recently, I came across someone on Twitter wondering out loud what property tax is for, given they pay for their own bin service and given Irish Water is a separate body. But this is to miss the point entirely: property taxes are rarely used to cover the cost of household-by-household utilities like water and waste. They are instead used for the general amenities. Those general amenities are, ultimately, where the value of the land under a dwelling comes from. So far, so good. We could apply the ESRI research to the Irish housing market, work out what fraction of the value of housing in our cities comes from urban green space, and give that fraction to the people responsible for maintaining those parks. But what happens when the amenities provided by society change? Once that happens, it is critical that the property tax change too. And this is why Ireland’s Local Property Tax, as currently set up, is far from ideal. LPT is based on market values five years ago. Much of the focus has been on the overall change in property values since then. As the Daft.ie Report out a week ago shows, values in Dublin have risen by 50% in those same five years. One of the main advantages of a sizeable property tax – say a tax of 1% of the value per year, as is common elsewhere, rather than less than one fifth of that – is to moderate swings in property values. Thus, it is likely that if the property tax had been bigger, and had been increased every 1 or 2 years, property prices would have risen by less than 50% over the last five years. But, as the saying goes, we are where we are. And electorally, I can’t see anyone coming to power with the slogan “We’ll Triple Your Property Tax”. So the big upswing in values can be overcome by reverse engineering the rate of property tax, perhaps relative to a national minimum. So, if Dublin City Council needs an annual budget of €1bn and 5% of that comes from LPT, then as the value of property within the DCC area goes up, the rate of LPT can go down to compensate. But what about new amenities? A classic example is new transport infrastructure and Dublin is experiencing that at the moment. The cross-city Luas has changed the economic geography of Dublin for the rest of the century. Cabra, largely ignored by many house-hunters, is now one of the hottest markets in the country, because of the cross-city Luas on its door. Across the north-west inner city, the cross-city Luas is having a huge impact on property values. A fair property tax system would adjust the relative values so that people who have seen their wealth boosted by public investments pay a small bit more each year. LPT is set-up backwards: the Minister for Finance effectively has to sanction a revaluation – and when is it in his interest, politically, to do that? What we need instead is a revised LPT that automatically revalues every two years, no exceptions, so that no-one has to grasp the nettle and decide to revalue. If nothing else, it might get politicians more serious about restraining – and ultimately bringing back down – high property prices in this country. The latest Daft.ie House Price Report is out today and, for most readers, its headline findings will be unsurprising. Prices rose in the first quarter of the year – compared to either the previous quarter or the same time last year – in almost all of the 54 markets covered by the report. Closely related to this, the availability of property – especially outside the cities – continues to dwindle. While the number of homes on the market in Dublin is actually up, year-on-year, from roughly 2,700 to about 3,500, elsewhere it continues to fall. Outside Dublin, there are just 16,800 homes on the market – the lowest ever recorded, since Daft.ie started recording the total number of properties on the market, back in January 2007. The overall pattern is clear: given there is strong demand for housing countrywide, the lack of supply – especially of newly built homes – is driving prices up. But not everywhere is experiencing the same growth in housing demand. Dublin is seeing increasing stock on the market – especially as the new homes segment shows on-going signs of recovery. But nonetheless, the increase in prices there in the last year, 8.4%, was greater than elsewhere in the country (6.5%). This is each area of the country is really its own local market, with factors – such as proximity to jobs or to amenities like schools or transport – that determine whether demand is stronger or weaker than the national average. The Daft.ie Report breaks down the country into almost 400 “micro-markets”. 117 of those are in Dublin, with a further 39 in the other four cities and the remaining 233 spread across the country – 89 in Leinster, 76 in Munster and 68 in Connacht-Ulster. For each of these micro-markets, it is possible to trace the path of the average sale price of housing. These averages are independent of changes in the mix of properties listed for sale, so differences over time are not being driven by more four beds or fewer apartments on the market. The figure accompanying this piece shows the twenty hottest and twenty coolest markets in the country, as measured by how much prices have increased in the last year. At the hottest end of the market, there is a real mix of areas. Some are in Dublin – in particular around Dublin 8, where the South Circular Road, Portobello, Rialto and Harold’s Cross are all seeing very strong increases. Smithfield and Cabra, close to the new Luas, Rathgar and Loughlinstown are also among the areas seeing the biggest increases – but there are plenty of areas outside Dublin where prices are rising rapidly. These include rural Westmeath, Mountbellew and Gort in Galway, and North Kerry, as well as Watergrasshill and Mitchelstown in Cork. Switching to the coolest market, there are a number of areas where average list prices now are below those a year ago. While this may seem odd, given the strength of demand, when breaking up the country where prices are increasing by 7% a year into almost 400 markets, it is to be expected that there will be some with prices falling. Some of the falls represent a market taking a step back, after very strong increases a year ago that – it seems from trends this year – were not sustainable. This includes the Beare Peninsula, Sligo’s suburbs, and Tara, in Meath, where prices a year ago were increasing at rates above 20% a year. This alone should suggest some caution against assuming that the areas now seeing very fast growth will keep all that price growth in the quarters to come. Nonetheless, like Dublin 8 in the hot markets, there are clear patterns among the cold markets. Six of the 20 coldest markets are in Donegal and a further four are near the border, including North-East Louth and Cootehill. If this border turned hard with Brexit in the near future, these would be the areas most affected by being cut off from obvious trading partners down the road. Of the other colder markets, one thing jumps out: distance from jobs. While the part of Tipperary closest to Limerick city is seeing prices grow strongly, there are parts of the same county further south where prices are falling back. Similarly, areas like Foxford or South Leitrim do not have good connections to major urban centres. Irish politicians would like to be able to overturn the laws of economics and get lots of well-paying jobs in Ireland’s smaller towns. But clustering is everything in the modern economy. The best hope of bringing about a population increase in such locations is to make their closest cities bigger and closer. But how can you move Leitrim closer to a city? Transport infrastructure is the only way that this can be done. House prices in Laois have risen much more than in Offaly in recent years, as it benefited from better motorway access than its neighbour. Motorway-led development, though, brings sprawl, with personal and environmental costs that may be too high to make it worthwhile. For that reason, it may be best to allow Ireland’s cities to continue to be successful. Bigger cities can sustain larger hinterlands around them. So it is in the interests of Leitrim and Tipperary to see Galway, Cork and Dublin continue to grab huge shares of the global FDI jobs on offer.